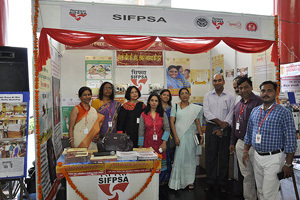 On 24th July 2015 SIFPSA organized 'Janani' IEC Mela at Scientific Convention Centre, Lucknow on the last day of "World Population Fortnight" celebrations fortnight. The objective of 'Janani' IEC Mela was to spread the message "marriage at right age, planned baby, spacing between two children and not too many children" as 2015 is marked as "Safe Mother and Child" year. Also, through this mela effort was made to disseminate information related to Health & Family Welfare programmes, services and facilities available for the people of Uttar Pradesh. 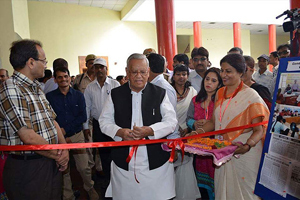 Shri Ahmad Hasan, Hon'ble Minister for Health & Family Welfare, GOUP inaugurated the health mela 'Janani'.Mr. Arvind Kumar, Principal Secretary, Medical, Health & Family, Mr. Amit Kumar Ghosh, Executive Director, SIFPSA, Mr. Rigzin Samphel, AED, SIFPSA, DG, Family Welfare and Director Family Welfare also graced the occasion by their presence.Address by chief guest and other dignitaries encouraged the audience specially adolescents boys and girls from various schools to think about growing population issues, health and social benefits of planned families. On this occasion Hon'ble Health Minister rewarded 20 best performing doctors and other support staff of different districts of UP for their best contribution to promote Family Planning Program. On this occasion an infotainment program by Jaya Founder band which is an all women band spread the message on "Save the girl child and female foeticide". 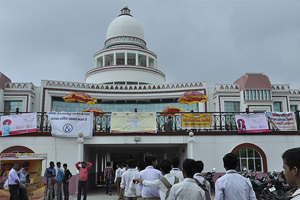 Folk shows like Magic and Birha were also organized to attract the audience. Huge numbers of college students were also present to enjoy the Mela. They were informed about adolescent Health issues by counselors. Free condom distribution facility was there in Mela. SIFPSA and NHM along with other Development partners viz PSI, HLFPPT, PFI, World Vision, FPAI, PSS, Janani, MSI, Path Finder, Care India, MAMTA had put up their stalls to showcase various activities carried by them in the field of health and Family Planning. Various stalls showed and displayed short films, posters, info games and organized quiz contest. A separate counseling center for adolescent girls and boys were setup to address their health related queries. This was one of the most successful programme organized by SIFPSA on World Population Fortnight.